There may be no more a famous play in college football history when Doug Flutie’s Hail Mary pass to Gerard Phelan on the final play of the game led the visiting Boston College Eagles to a miracle 47-45 victory over the Miami Hurricanes at the Orange Bowl in front of a national TV audience a day after Thanksgiving in 1984. Flutie’s performance in Miami that day was spectacular, throwing for 472 yards and four touchdowns as he became the first quarterback in college history to surpass 10,000 yards. 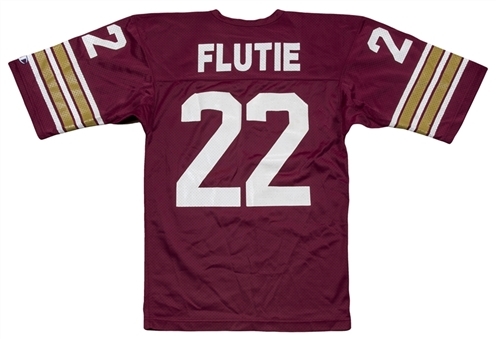 Flutie would win the 1984 Heisman Trophy. The performance in Miami was indicative of Flutie’s career at Boston College, which spanned from 1981-1984. Recruited out of nearby Natick High School, Flutie finished his college career with 10,579 passing yards and 67 touchdowns. In addition to his Heisman Trophy, Flutie earned the Maxwell Award, the Davey O’Brien National Quarterback Award and was named Player of the Year from various outlets, including UPI, The Sporting News and Kodak. Flutie was inducted in to the College Football Hall of Fame in May of 2007 in his first year of eligibility. 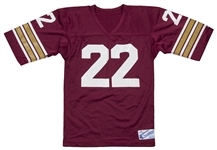 Presented here is the burgundy home Boston College jersey worn by Flutie during his college career. This size medium mesh jersey was manufactured by Champion and features Flutie’s number “22” screen-printed on the front, back and sleeves in white. 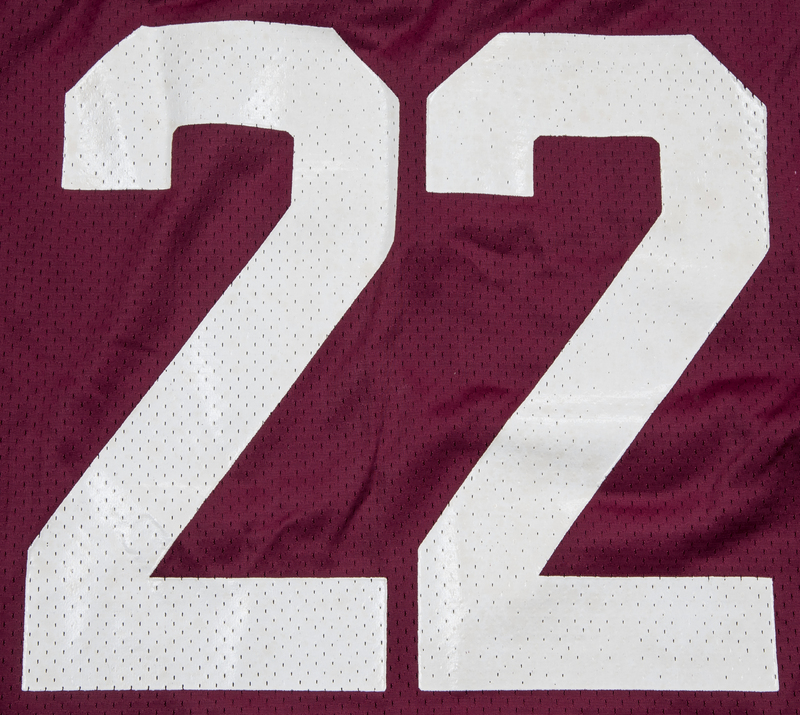 The back of the jersey has “FLUTIE” screen-printed in white directly to the jersey above his number. The sleeves have white and gold stripes screen-printed and the Champion logo patch is sewn on the left sleeve. 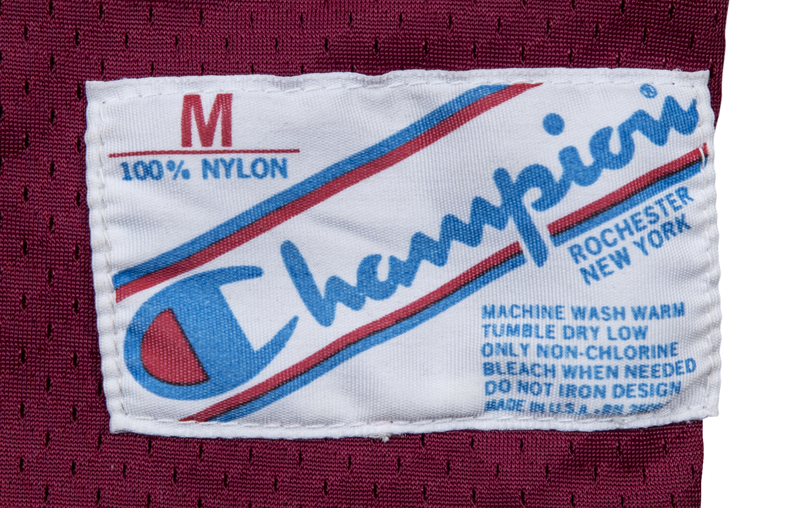 The “Champion Rochester New York” tag is sewn on the bottom front left tail. This jersey displays moderate use and is in excellent condition given its age. A wonderful opportunity to own a jersey from one of the greatest college quarterbacks of all-time. 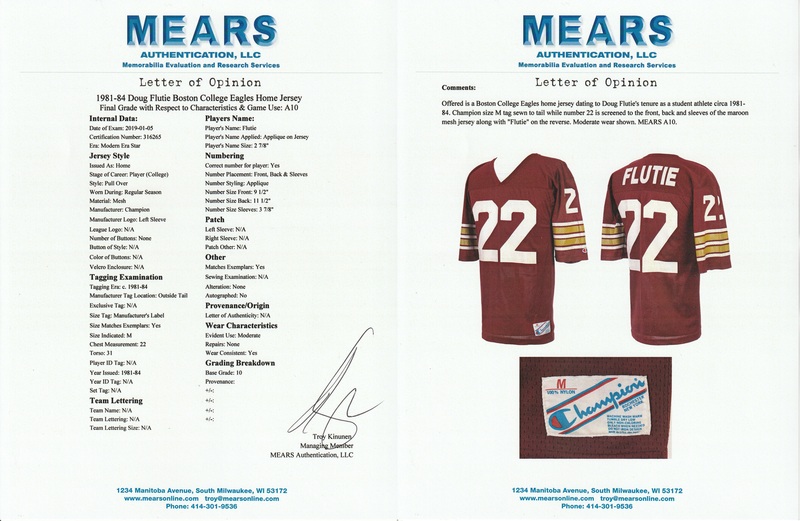 This jersey comes with a LOA from MEARS (316265) for the game use, who have dated this jersey to Flutie’s full college career (1981-84) and have graded this a perfect A10.